Everything around us is changing faster than we could ever imagine. While many business leaders are embracing the change, there are those who are still trying to manage it. It cannot be managed as it is ever-evolving and like many organizations, many leaders need to free themselves from antiquated management practices in 2016. This is the year where many will start realizing that the biggest change happening in business is about having a 21st century mindset, as the technology will continue to evolve, and what is needed is the realization that we are moving into both a human-to-human and experience economy. As Jim Love, Chief Information Officer, IT World Canada, generously shared in his story for Our Journey to Business Common Sense (published early 2016), we are so busy trying to create new methodologies and formulas for business today that we are simply stuck. There is no magic seven step how-to approach that someone can come and implement for us; that thinking in itself is stuck in the last century. The answers are right in front of us if we stop, listen and create mindfully on the road ahead. The 21st century leader understands that she has everything she needs to create the space and bring in the people to co-create what’s possible in business today. Many of the trends that will come into focus in 2016 are already here and it’s time for more leaders to start thinking about the transitions they need to make, as you will increasingly find your world changing faster than you ever imagined. In today’s fast paced world, the organizations that are re-inventing themselves are the ones that are moving to the edges with purpose. They value dialogue and understand that people are at the center of everything. What’s new is old. The currency is trust and relationships. Here are seven of the top trends that you need to start thinking about and having conversations to co-create a 21st century mindset. These will continue to grow in this century and the evolution in steps your teams need to start putting into action. There are more questions and suggestions here because in the 21st century, no one else has the answers for us as individuals or organizations, no matter how much they try to convince you otherwise. 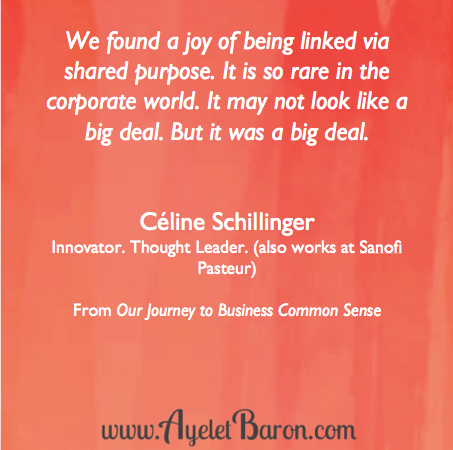 In writing and co-creating Our Journey to Business Common Sense, I have talked to amazing 21st century leaders around the world and this reflects their stories, which are featured in detail in the book. There are still many leaders who practice 20th century leadership where fear, competition and top-down approaches are all they know in managing people. But what they don’t realize is that in the 21st century adults don’t need to be managed and supervised. We no longer need charismatic leadership as we are not following people into war to crush the competition. The 21st century leader knows there is enough for everyone and that if they can have their people tap into their imagination, the opportunities are on the edge and plentiful. In 2016, 21st century leaders: 1) build community, both inside and outside the organizational walls; 2) drives business results through shared purpose; 3) builds trusted relationships with their employees, customers, partners and vendors; and 4) creates the space for the conversation and the solutions to emerge. The expert model is left behind in the last century where you had to be the smartest person in the room to shine. In this century, leaders show up around creating shared purpose and understanding the power of hiring the best and the brightest to partner with them. In 10 years, we will no longer need corporate social responsibility departments as we will work for organizations that understand that business is a a force of good. In 2016, what are you doing to finding your 21st century leaders across the organization (not your top performers) and give them a voice? What space will they be able to create to reach amazing business results? Shared purpose is becoming increasingly important in the hearts of people. It goes deeper than knowing your personal or organizational brand; it’s about connecting your personal purpose with that of the business you work with. The 21st century leader understands that they need a foundation and an engine to drive their business. They are not layering more and more useless strategies and programs on more complex organization structures. They don’t discuss jargon-laden concepts; instead, they create shared purpose. In 2016, communication becomes key and not through a function but what conversations are taking place across your organization. Can everyone working every day connect what they do with the purpose of the organization or is it just words hanging up in the virtual lobby of your office building? Because this is what the 21st century employee is seeking. In 2016, will every single person in your ecosystem (customers, partners, employers, freelancers and vendors) have an understanding of your purpose? Is your own purpose tied to that of the organization? Do people wake up every morning excited about what you are creating in the world? It’s time to break down the walls and become whole again. Holistic solutions become more important to deliver on the shared purpose. Illusionary separation of internal and external will come down. An increasing number of people want to bring their whole selves to work, whether they are full-time employees or freelancers, whether they are Millennials or Generation X. It doesn’t matter anymore. There is a need for integration. Innovation should never be a department. In 2016, we get back to figuring out what our work means and we will be age-agnostic and hopefully, we will start the journey to being gender-agnostic and geographical-agnostic. We will realize we work with purpose and in the best interest of ourselves and the organization. We need to stop fragmenting the workforce across gender, age and other demographic, and instead bring them together around shared meaning and purpose. We need to stop seeing our customers as external “stakeholders” and create better systems to truly listen and provide them with stellar experiences. Whole people want whole solutions, and want to feel trusted and respected. In 2016, invest more in what makes your business whole. In 2016, are you focused on segmenting your organizations into groups or are you bringing people together around your shared purpose? Instead of understanding Millennials, are you creating whole business strategies and finding the best people, regardless of age, gender or geography, to get it to market and drive results? Do you have a simple holistic strategy and approach tapping into your people? Is empathy important to you and how are you listening? It’s time to rethink who works for you, partners with you and benefits from your products or services. The walls are coming down between departments and all the divisions that have been created by antiquated management practices. In 2016, you need to be clear on your purpose and be able to bring the right people at the right time to stay relevant. Somehow in the 20th century, we not only fragmented our companies to fight against each other, but we have done the same with functions within the organization. Think about a team building event you took part of. Was your entire organization there or was it simply for your function or department? Did some people feel left out because they were not viewed as being part of the team? The antiquated systems in so many of today’s organization restrict our ability to connect with people who can help us be more effective in our work. We may have had a successful team building event or offsite, but we may have created bigger divides within the organization, what was the point? This is not 21st century collaboration, where it does not matter what box you are in but how you can contribute to the bottom line results of the organization with others who share your purpose. In 2016, the old technology of two-way conversations makes a comeback and we lead with integration and empathy to create holistic solutions in the new economy. Think about who is in your connected network and how are you building communities? In 2016, are you investing time in more layers of organization structure or are you focused on your top projects with the best people? Are you able to easily tap into people’s ideas and connect then? Have you shut down your formal “innovation department” and realized every single person in your organization is creative and can think up new ideas? Are you obsessed with the latest organization chart, or can people work together through connection and collaboration? When conscious 21st century leaders create space and bring people together to co-create, they are using new ways of working. As technology is increasingly being seen as an enabler of business instead of the holy grail, more organizations will finally recognize the importance of collaboration tools to connect everyone inside and outside their organization in conversation. In 2016, more people will realize that we need to move our 20th century mindset around technology and adopt a 21st century one, where we fully understand that we are driving technology and its benefits to our day-to-day business. If you do one thing in 2016, take a close look at how your organization is working out loud and collaborating in new ways via open conversations connecting people around the world. You can find out more here and also read John Stepper‘s book. And what’s even cooler is that you can ask me to connect you to John and other practitioners in my community like Catherine Shinners or reach out to them directly on LinkedIn or Twitter and let them know I sent you. That is the 21st century way of working that many people like Carol Read, who I met on Twitter, are paving the way for us. Carol shares insightful stories in the book on new ways of working. I am also part of a bigger global community that is bringing so much richness to how we work in 2016 and beyond that I’d be happy to connect you with. In 2016, find new ways of being and working to truly connect people in two-way conversations that drive results. In 2016, are you still trying to control communication or is information flowing to the right people at the right time? Are you able to share information openly? Are you truly tapping into the richness of technology as a driver of your business or are you still enslaved by it? Is everyone in your organization using video chats, when you are not in the same physical space, and easily connecting and collaborating? Have you taken down the one-way communication department and replaced it with conscious leaders who have conversations? Today, we have enough. And we need to move away from notions of taking market share from our competitors, to recognizing that living in an open and connected world means we can find people who love what we make or do anywhere on the planet. We don’t have to kill anyone in the process. We don’t need war rooms to strategize our next moves. All we need is some healthy common sense and ancient wisdom; both are readily available. In 2016, think about unusual partners you can go to market with who are outside the traditional lines. We know how to get together in a room and have the tools that we need with fancy flipcharts, markers and bagels, but do we know how to build community? Do we know how to transform the conversation in the room to a constant conversation? How do you continue to have the collaboration and bring each other into opportunities and activate being a resource? How can what happens today translate into an ongoing way of collaborating? How do we get people to see beyond the transaction of the meeting or the offsite? In 2016, bring the outside in and bring the inside out by infusing in your strategy who your key co-creators are as that is the fuel of the future. Co-creation is the common sense and intent of your work. It’s a feeling and it’s already there. It’s about honouring and acknowledging it. In 2016, do you have specific individual and integrated team goals? Do you have open communities where people can easily find each other and co-create? Are people having random collisions with unusual partners or are they stuck in the mainstream? Do you have access to the best talent outside your organizational walls of the people who have chosen to work for themselves and have so much to offer you? Do you have a blended workforce and can easily tap into the bests minds in the world to help you stay relevant? Have you addressed your back-end systems to make sure you can bring together the best team of people to co-create? There are many who have been conditioned by the success trap – the manner in which so many career professionals find themselves on a path towards promotion responsibility and accountability that slowly but surely absorbs energy from other meaningful life activities. Then success was defined by finding the holy grail of work-life balance. Work-life balance is an unattainable myth because the very definition of this term is part of the problem, and offer an alternative philosophy to purposeful living – what my co-researcher Jamie Anderson and I call LIFEworking. This is an approach that does not try to separate life and work into two distinct and seemingly incompatible spheres, but instead meshes both into a new way of thinking about a life journey in the 21st century. In 2016, more and more people across ALL age groups want to show up as whole people to work and will be starting to ask new questions that will have a direct impact on your attraction, retention and engagement strategies. In 2016, are you shutting down your work-life balance programs? Are you helping your leaders know how important it is to bring the best people to every project and that includes all people, without ratios and quotas? Do you have the best women and men of all ages, race, and geography delivering your shared purpose? Have you realized that people are starting to pick themselves and that fear has no place in the workplace? Have you shut down your annual employee survey and listen to people on your collaboration platform on an ongoing basis? I am not a personal brand. I am an author and professional speaker who wants the opportunity to share a new way of living and working in the 21st century with people in organizations who are ready to become 21st century leaders and pursue LIFEworking. That is my purpose as an activist for the human spirit. I don’t have an elevator pitch, since research has shown that not many people ever bought much in an elevator. My goal is for people to know what I bring to the world and invite me to co-create with them. I look forward to conversing with you and exploring what’s possible in 2016. You know where to find me. 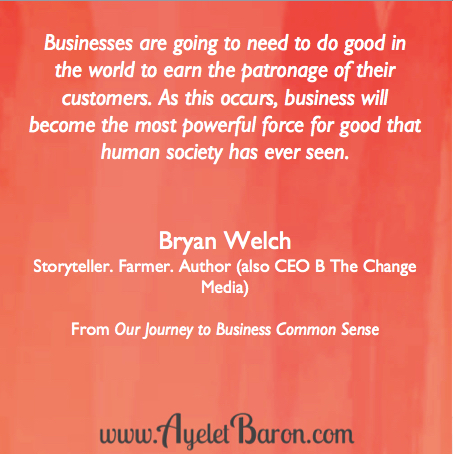 I am getting ready to launch my crowdfunding, co-creating campaign for my new book, Our Journey to Business Common Sense, in December as a way to not only launch this new movement for business in 2016, but also co-create and share the stories of over thirty 21st century leaders from around the world. This is the year for all of us to lead with action and be bold. Our actions need to match our words in this century because people matter.